There’s no question, most police officers understand and respect the role of the media in a free society. And there’s no question that most police officers understand and respect the fact that the media can shoot pictures and gather news on public property. But every now and then, a cop who doesn’t understand the limitations of his own badge gets it wrong. 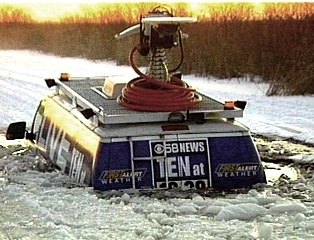 In the case of a Newark NJ “special officer” Sunday, he justified the detention of a WCBS-TV photog by saying: “I can do whatever I want.” Wrong. 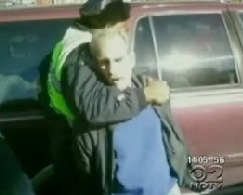 Jim Quodomine’s camera continued to roll as the cop grabbed the camera, then put the photog in a chokehold. Quodomine was on public property, covering a peaceful protest. Several bystanders snapped photos, and it appears reporter Christine Sloan picked up Quodomine’s camera and shot some video of her photog’s detention. A Newark city councilwoman watched the scene, convinced the cop to release the photog (after an hour in the back of a patrol car) and filed a complaint with the Mayor. On Monday, the city of Newark suspended Special Officer Brian Shariff without pay. Mayor Cory Booker said he was “disgusted” and “disturbed” by the incident. One wonders what this cop got away with when no cameras were around. It takes an extraordinary act of dumbassery to turn a member of the news media into a sympathetic figure. Way to go, Shariff. Your future as a rent-a-cop is all but ensured. Or maybe the Burmese state police have an opening. This entry was posted in Uncategorized and tagged chokehold, dumbassery, photographer, wcbs on October 28, 2008 by live apt fire. i know a couple photographers i’d like to put in a choke hold. My understanding from watching documentaries about the former mayor of Newark (Sharpe?) is that this particular city is very well versed in media intimidation. I think “dumbassery” should be a new tag. Never tell a photographer, “DON’T TAKE MY PICTURE”. That is the most sure fired way to find yourself on tv….Right Scott…. easy don! i know a couple photogs at yr old station that would talk so much to the cop in the jail cell… the police would have to pay WSB to take them back! The worst thing you can tell a photographer is to turn off the camera especially when the photog is on public property. When you turn the camera on the cop that’s usually when they explode cause they know you actually have the power at least till they arrest you!